We’ve discussed white space in the product network signified by regions A, B, and C in the Product Management Triangle. As a company matures, these regions become filled with bands connecting the elements together. 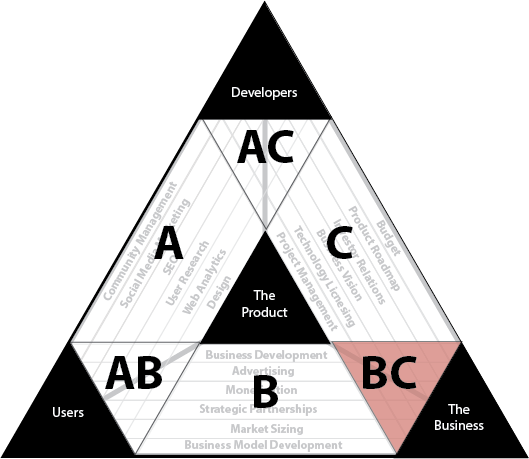 A designer may be hired to form a band connecting users and developers or a head of business development may be hired to connect users and the business. Figure 4. Product management’s areas of responsibility. Figure 5. Tension region AB. user attention is attracted to sell to advertisers. Which of these cases applies has huge implications for the amount of tension in region AB. The tension in case #1 is relatively low because the same things that make users like the product more will often generate more revenue for the company. By meaningfully improving the product, more people will learn about it and pay for it. In case #2, however, there is an inherent conflict between creating a single product that is valuable to users and advertisers. Ads can degrade the user experience and association with corporate advertisers can erode trust. Conversely, adding efficiencies to the user experience can sometimes reduce ad impressions, hurting the bottom line. It is critical for someone to synthesize the business and user needs to weigh trade-offs and devise product solutions meeting holistic company needs. The need for synthesis is not limited to handling criss-crossing inputs coming from adjacent white space regions. Sometime multiple inputs from one region require alignment. Even if you were to ignore the business demands of a product from white space region B, there could be conflicting inputs just within white space region A. For example, two people, each responsible for representing user needs, may disagree on how to create an optimal user experience. There is need for an individual to be ultimately responsible for the user experience and reconcile conflicting perspectives between team members. Figure 6. Tension region BC. Tension region BC is the place where bands from white space B must come together with bands from white space C to form a coherent business strategy. This is the region where business ideas are filtered and set into motion through resourcing, prioritization, and incorporation in the business vision. The people filling white space B generate hypotheses for how the product can evolve to grow the business. There is need for someone to own the narrative of the company’s mission, objectives, and capabilities. As new business ideas bubble up, region BC is about identifying which concepts fit the company’s narrative and which ones don’t. A strong filter will allow the company to focus on development areas that have the best shot at success based on the marketplace and the company’s core competencies. Tension region BC is a primary place where a company’s knowledge is codified. It is essential that, as product hypotheses succeed and fail, the learning is incorporated into the company narrative. While many startups fail through reasons outside their control, a startup, through strong management in region BC, can improve its ability to pick winning product ideas over time. Figure 7. Tension region AC. Tension region AC is the place where bands from white space A must come together with bands from white space C to form a clear, feasible plan for developers. Inputs from white space A explain how a product would ideally behave to benefit end users. Inputs from white space C dictate what is possible to achieve given available resources and competing business priorities. When the two forces come together in region AC, tradeoffs are often required. The ideal solution is often too expensive or time consuming to reasonably build. Tension region AC is not about crushing the dreams of idealistic designers — it’s about devising solutions that meet user needs within business parameters. 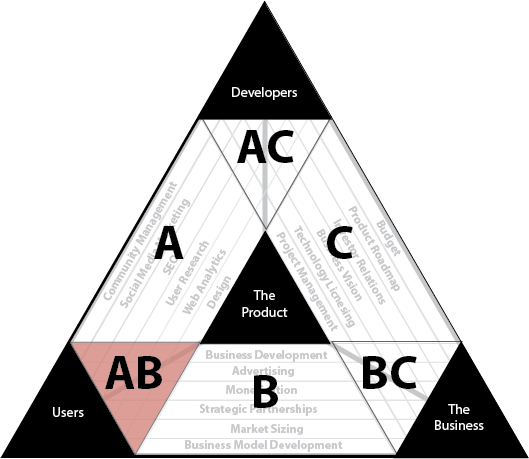 Tension region AC is where the notion of the Minimum Viable Product (MVP) was born. Developing the MVP is about expending the smallest amount of effort possible to enable users to engage with the product in a manner that will validate or invalidate the business hypothesis at hand. A company’s ability to effectively deliver MVPs equates their ability to rapidly iterate, learn, and ultimately discover successful products. Deciding what features should be “in” or “out” of an MVP is is an art. It requires a feel for what really matters to users and how the product is positioned to evolve.